You have until Saturday to see the paintings that last shocked and fascinated the public over half a century ago in Paris. ArtistAngle Gallery’s one-man show by the late master-artist-turned-master-teacher Myron Barnstone, Emotions: How Art Awakens the Soul, marks the finale of what’s been a 5-month revolving Barnstone exhibit. Since March, ArtistAngle has unveiled paintings and drawings never before seen in the US, and locked away for 50 years after Barnstone decided to put down his brushes to devote the next 35 years of his life to teaching. Since March, side by side with Barnstone’s original pieces have been works by some of the thousands of distinguished students he taught through the decades in his Coplay, Pennsylvania studios. He insisted his classes learn the disciplined foundation of the classical masters -- the geometric design of The Golden Section. A testament to his teaching skill is how many Barnstone Studios alumni have achieved success in art-related fields like architecture, industrial design, animation, sculpture and photography. Many are university professors, authors, and full-time professional artists, with work in galleries and private collections around the globe. Emotions: How Art Awakens the Soul draws heavily on Barnstone’s passionate depictions of the horrors of both nuclear war, and the Holocaust. 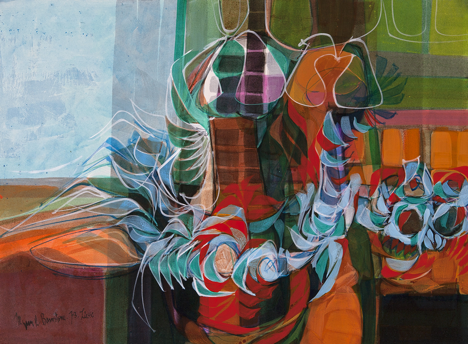 Barnstone’s unique style has been described as modern abstract figurative painting related to the 'School of London' artists that include Ron Kitaj (who was a friend), Francis Bacon, and Lucien Freud. A virtuoso draftsman and master anatomist, Barnstone was also influenced by English painters Graham Sutherland and Michael Ayrton. ArtistAngle Gallery is located on the east side of historic downtown Frederick on the corner of South Carroll and Commerce Streets. Contact the gallery at 240.285.3758, or through the website at TheArtistAngle.com.